Jo Sias Daniel is a Professor in the Civil & Environmental Engineering Department at University of New Hampshire. 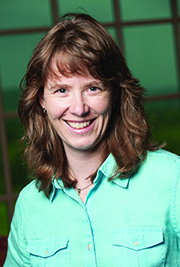 She is the director of the UNH Center for Infrastructure Resilience to Climate. My high school physics class did a toothpick bridge project that I really enjoyed. I found out that civil engineers designed bridges, and decided to pursue civil engineering in college. During my junior year at the University of New Hampshire, I had the opportunity to participate as a summer undergraduate researcher in Dr. Y. Richard Kim’s lab at North Carolina State University. I loved the work that I did that summer and the challenge of working with asphalt materials, and decided to attend graduate school at NCSU under Dr. Kim’s guidance. What are you learning about the effectiveness of RAS and RAP in mixtures? Recycled materials can be very effective and can perform very well if they are designed appropriately for the intended application. When working with any combination of materials, you need to have a good understanding of the properties of each component material. Not all RAP or RAS materials are the same, and they will interact differently with different grades and sources of virgin binders depending on the properties of each. Some of our recent research is pointing to the importance of understanding the impacts of production parameters on the properties, and ultimately the performance, of mixtures as well. What are the best ways to evaluate cracking when it comes to RAP? Volumetric parameters are not enough. Neither are linear viscoelastic material properties. You need to use some kind of performance test that measures the resistance of the material to fracture. There are many different mechanisms that cause asphalt mixtures to crack, and there isn’t a single test that can cover all of these. The myriad of available cracking tests all have advantages and disadvantages, and some are more appropriate for research level evaluation while others are closer to being implementable in QA processes. At this point, pavement engineers need to determine what is most appropriate for a particular situation based on their experience and judgment. How might climate change affect road design when it comes to asphalt? I think the biggest challenges to pavement engineers will be: 1) increased freeze/thaw cycles, which will mostly impact lower volume roads in northern climates and 2) increased frequency of extreme rain events that cause flooding and washouts. We can handle expected temperature increases relatively easily by using different binder grades, but we really don’t have a very good understanding of how the load carrying capacity or durability of a pavement changes with flooding events – both in short term and long term. Engineers and climate scientists need to work together to find solutions that work for projected future climate conditions. There are many potential topic areas within asphalt pavements and materials, which is part of what makes the discipline so interesting and challenging. You can focus on different scales, chemistry, mechanical properties, modeling and theoretical development, laboratory characterization, construction, field performance, sustainability, new innovative materials or any combination of these. Whichever area(s) you choose, you MUST keep in mind the ultimate goal of all asphalt related research – better performing, longer lasting, cost efficient pavements for the safe transportation of people and goods around the world. So make sure your research work is grounded in the real world.